When skiing with Courtney at the sprint at NorAms this year – I knew at that race that 2010 was going to be a great season for Courtney and me. 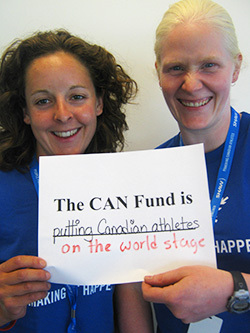 The CAN Fund is an incredible organization – they get money into the hands of Canada’s athletes exactly when it’s needed most. I especially admire how they help build relationships between athletes and their supporters and encourage athletes to give back when they can. I’m primarily a rower but rowing and cross country skiing are pretty complementary and I expected my rowing training would prepare me to ski with Courtney. What I hadn’t expected was that the most useful skill I would bring from rowing to paranordic guiding was the ability to shoulder check at race pace – in rowing we go backwards and always have to shoulder check to see our course and in guiding I’m constantly checking to make sure Courtney is still right behind me.